Rendang is a popular Malay dish that prepares meat in an unhurried manner, cooking it in generous amounts of spices and coconut milk until the meat is tender, juicy and falling off the bones. 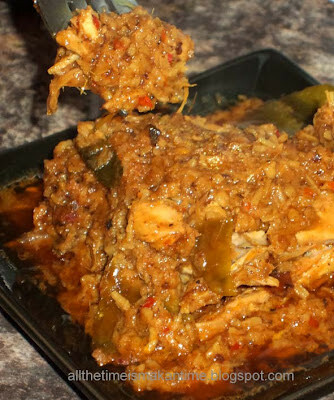 Served with nasi lemak, it can turn a simple plate of nasi lemak into an extravagant meal. It is also served with lemang (glutinous rice cooked with coconut milk in the hollow of a bamboo over slow fire). 1 kg of chicken, trimmed of excessive fat, cleaned and chopped into medium sized pieces. In a low heat pan, roast the desiccated coconut without any until it turns a light brown colour. Remove from heat and put it aside for later. If you are using freshly grated coconut instead of the dried pre-packed variety, you will need to pound the roasted coconut for a few minutes using a mortar and pestle. Blend ingredients A until smooth and fry it in a small amount of oil in a pot or wok (with lid). When you can smell the fragrant aroma arising from the paste, add the chicken, season with salt and stir. Leave the lid on for 5-10 minutes. If you are using freshly grated coconut to obtain the milk for this dish, then keep aside the first pressing, which gives you the thicker milk for later and use about a cup of the second pressing (more dilute) or water to cook the meat in. Scissor in the lime leaves into this mixture. Simmer the ingredients for 60 to 90 minutes on very low heat. Pour in the thick coconut milk, cook further for about 20 minutes. When the oil from the coconut milk separates and floats to the top, add the roasted coconut and stir well to allow them to soak up the excess liquid. Heat through for two minutes and the rendang is ready to be served.